and impracticable that–that–it's downright criminal! Many (many) years ago, when I first read War With The Newts, after scouring the Waterstones' internal database (whimsically named Ibid, and from which one could print the details of books onto the till roll in light- and so it seems, time-sensitive purple ink which, on the inches thick ream of leaves I printed for future perusal, faded within a few months rendering my catalogued wish list so much locker mulch) for authors with a suitably Czech-sounding name, having put away an entrée of my first slim Hrabal, a palate-cleansing Kundera and in need of a meaty Moravian main course, I think I might have completely and totally missed just how funny it was, bloated as I was by the doughy and Victorian-sounding translation and the rather unlikely ideation of the future political terroir of mankind and their unusual amphibian slaves and, latterly, sappers, the newts. How's that for a sentence David Foster Wallace? INTERROBANG. 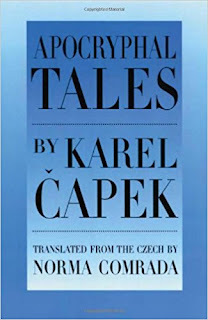 Well, there's no chance that Čapek's typically Czech blend of lament and lampoon can be so easily ignored in this frankly wonderful collection of classical, biblical, and contemporaneous satires, a collection no less that made me thrown down my own prejudices when it comes to story collections and embrace them wholeheartedly. Leaping off on his temporal journey with a story of the man who has invented the holiday in time (even though he's not gotten around to inventing time travel yet), Čapek passes a critical and yet strangely forgiving gaze over the humans at the heart of the Promethean myth, past neo-nostalgic neanderthal cave dwellers, through the drunken arguments of heroes of the Trojan campaigns, over the clucking birds of Classical antiquity and pious hypocrites of the biblical Middle East, including the ailing revenant Lazarus, to the deathbed of Don Juan and on to a surprisingly modern (meaning post-postmodern-modern) academic scandal. Some stand-out stories include the baker who fears for his livelihood if Jesus continues to go around feeding people with only a handful of old loaves; Emperor Diocletian whose eponymous persecution of the Christians stems from their overly romantic notions and lack of administrative nous rather than for their heretical tenets, with many of which he finds common cause; and the alternative script of Hamlet, in which he wants to be an actor! This is so far from the fusty, laboured satire I erroneously imagined ...Newts to be that I almost feel penitent for my immature opinion; almost, but as anyone who knows me knows, not at all. 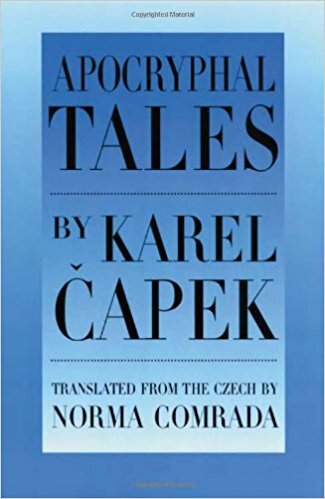 If you wanted to start small with your exploration of Czech literary genius, then this would be the ideal springboard to a lifetime of profound enjoyment.